#7-08 Magnificent antique throne chair in original condition. Almost 200 years old with extensive carvings. A true high-back chair, 60 inches tall with normal seat height. 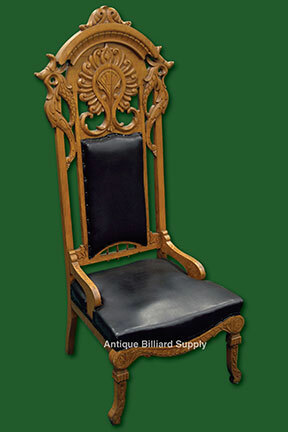 Use with riser for spectators at billiard matches or without for a spectacular throne-like appearance as a hall chair in an entryway or around a conference table in a hunting lodge or a ski resort. Never repaired or restored, shows almost no wear. A true piece of historic craftsmanship. Four available.